Bug bombs don't work in reducing cockroach infestations. At all. A study comparing bug bombs vs gel baits found that while big bombs didn't reduce German cockroach numbers, the baits did. And on top of that, even when used correctly (according to directions) the bug bombs resulted in a lot of pesticide residue throughout the residences - at 6 hours after being used, and one month later. The technical name for bug bombs is total release foggers. Different brands of bug bombs, with different pesticides, were used in the study - two different kinds of Hot-Shot No-Mess Foggers and two different kinds of Raid foggers. The gel baits used were Combat Insect Control Systems and Maxforce Gel Bait. The North Carolina State Univ. researchers pointed out that one major problem with bug bombs is that cockroaches have built up resistance to the pesticides used. Another problem is that their use in residences results in pesticide residues, even one month later. That means that people living there will breathe in or ingest the pesticide residues. Which can lead to health problems. On the other hand, there was no pesticide residue from the baits in the residences. And they reduced numbers of cockroaches. 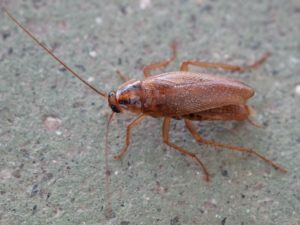 Using baits for cockroach control is a wonderful example of Integrated Pest Management - a least-toxic way of dealing with pests using various methods (e.g. baits, traps, fixing holes, vacuuming pests). Even though they were not used in the study, one should also consider bait gels containing boric acid. Bug bombs are completely ineffective at reducing German cockroach infestations, according to new research published in the journal BMC Public Health. Not only are they ineffective, research indicates that these products are putting people at unnecessary risk. “In a cost-benefit analysis, you’re getting all costs and no benefits,” said Zachary DeVries, PhD, co-author of the study. “Bug bombs are not killing cockroaches; they’re putting pesticides in places where the cockroaches aren’t; they’re not putting pesticides in places where cockroaches are and they’re increasing pesticide levels in the home.” ...continue reading "Bug Bombs Don’t Reduce Cockroach Numbers"